Custom executive computer desks made in Montana to order and shipped worldwide. Executive credenza custom handmade from unique slabs of Walnut and Sycamore. Size 84″ W x 30″ H x 36″ D.
Custom home office computer desks handmade to order. Size 28.5″ H x 72″ W x 26″ D.
This custom computer desk was designed for a renowned potter. Walnut Crotch top slab with Cherry bottom and Walnut feet. The butterflies are Ebony. Small pullout drawer for pencil and paper. Size 30″ H x 84″ W x 29/39″ D.
This desk feels like it wraps around you with the pronounced curve in front of you as you sit behind this desk. Beautiful Maple, highly figured with cedar pedestal base with drawers. Get your one of a kind custom computer desk today…. call 406-777-3772! 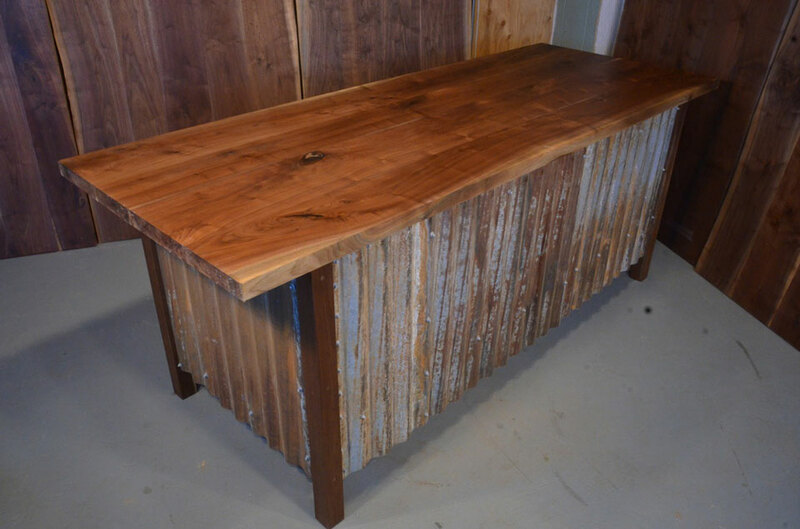 The Wrap Desk on a recycled corrugated steel base. Custom home office computer desks handmade to order from beautiful Maple slabs. a Birdseye maple center panel. 84″ L x 30″ H x 32″ W ( at the deepest point) Looking for a custom computer desk handmade to order? Custom executive computer desks hand built from unique and unusual woods. 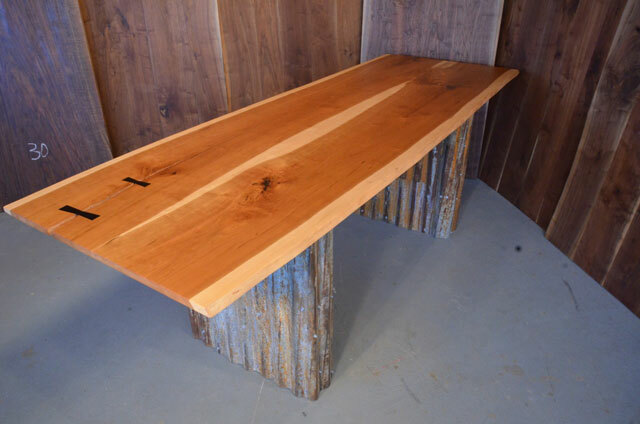 Unusual one of a kind custom live edge computer desks handcrafted using reclaimed and recycled hardwoods. Custom office computer desks made to order. Custom live edge computer desks handmade in Montana and shipped around the world. Quarter Sawn Sycamore and Cherry Desk with 4 Ebony Butterflies Approximately 6 foot long by 30″ Wide – SOLD Can make another similar to this design. Custom live edge computer desks handmade to order from unique and unusual woods. Burled Maple Slab Top with Sycamore pedestal base with file drawers. Custom office computer desks handmade to order and also many styles already in stock. Live edge custom computer desks handmade to order from unique reclaimed and recycled hardwoods. Custom computer desks handmade in Montana and shipped around the world. Office custom computer desks handmade in Montana and shipped around the world. Custom Computer desks handmade from unusual reclaimed and recycled woods. Walnut executive desk with double pedestal walnut base and handmade Ebony pulls. Rustic custom computer desks hand built from unique recycled and reclaimed hardwoods. Cherry desk top with Ebony butterflies and recycled corrugated steel base. Live edge custom computer desks handmade in Montana and shipped around the world. Quilted maple desk with curly maple double pedestal base. Features include handmade solid Ebony pulls. 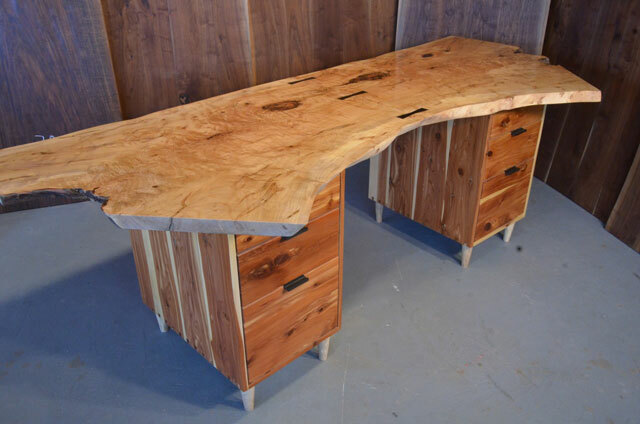 Custom Home office computer desks handcrafted from unusual recycled and reclaimed woods. Quilted Maple desk with simple cherry base. Office custom computer desks handmade by Dumonds Custom Furniture. If you’re looking for a custom built cabinet to fit your home or cabin, we can help you out! Let’s say you already have an idea in mind of a custom cabinet that you would like to have. You can submit your idea to us via our Request A Quote Form or call us directly at (406) 777-3772.